The international AXDW will take place on 29 March till 1 April in the Conference Center of the National Insurance Hall Avenue. 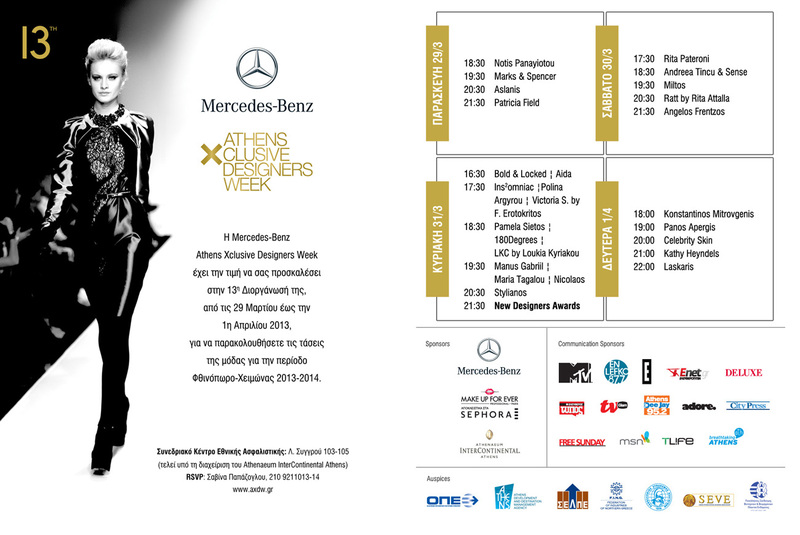 26 Greek and foreign fashion designers will present their collections for autumn / winter 2013-2014. The designers who will compete in the NDA (New Designers Awards) are:Bold & Locked, Aida, Insomniac by Spiros Stefanoudakis, Polina Argyrou, Victoria S. by F. Erotokritos, Pamela Sietos, 180Degrees, LKC by Loukia Kyriakou, Manus Gabriil, Maria Tagalou, Nicolaos. The MB AXDW is pleased to host the head makeup artists of MAKE UP FOREVER from Paris who together with his Greek make up artist Emmanuel Apostolakis, will curate the makeup for the fashion shows of the event.